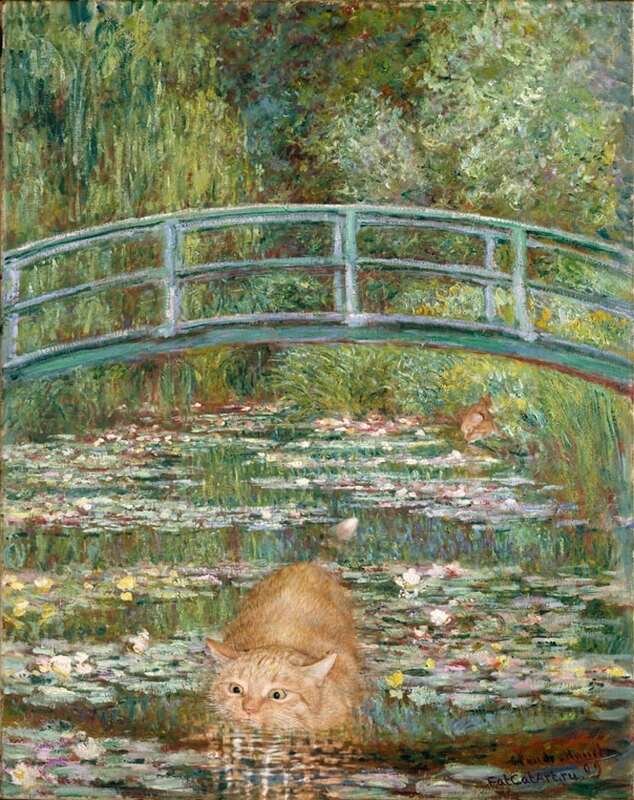 Once upon a time, two women in different parts of the world asked themselves this unusual question: “What would happen if I fit my cat into my favorite paintings?” Later on, Cats Galore and Fat Cat Art were born. And the internet lived happily ever after. Wanna have a little laugh while learning art facts? Or smoothly introduce art ed to your family members and friends? If the answer is yes, you should absolutely start with these cat art paintings! Thanks to the amazing Svetlana Petrova, her sassy cat Zarathustra, and Susan Herbert, your dream is about to become reality. 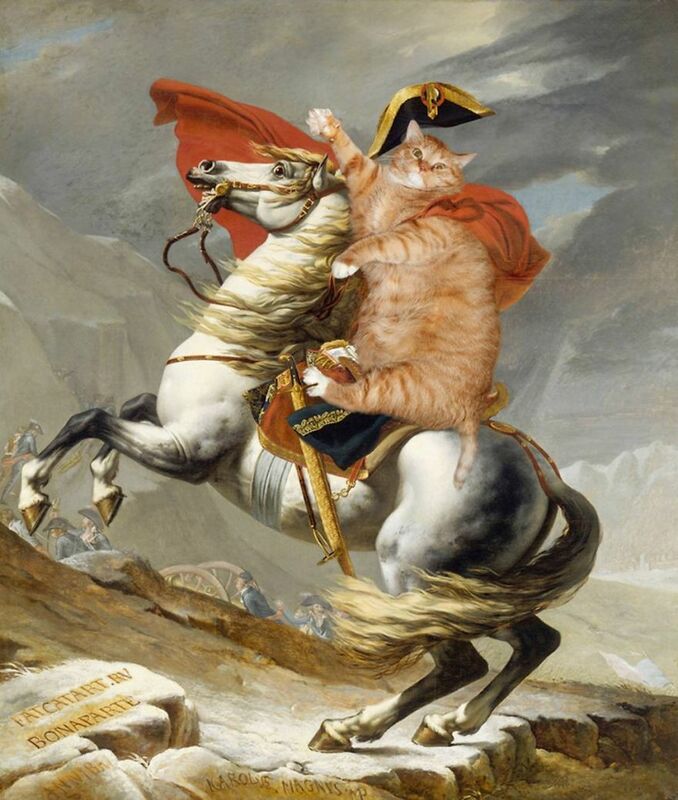 Here are the cat art masterpieces that classical art was missing. First, let’s kick off this unusual art tour with Susan Herbert’s paintings. 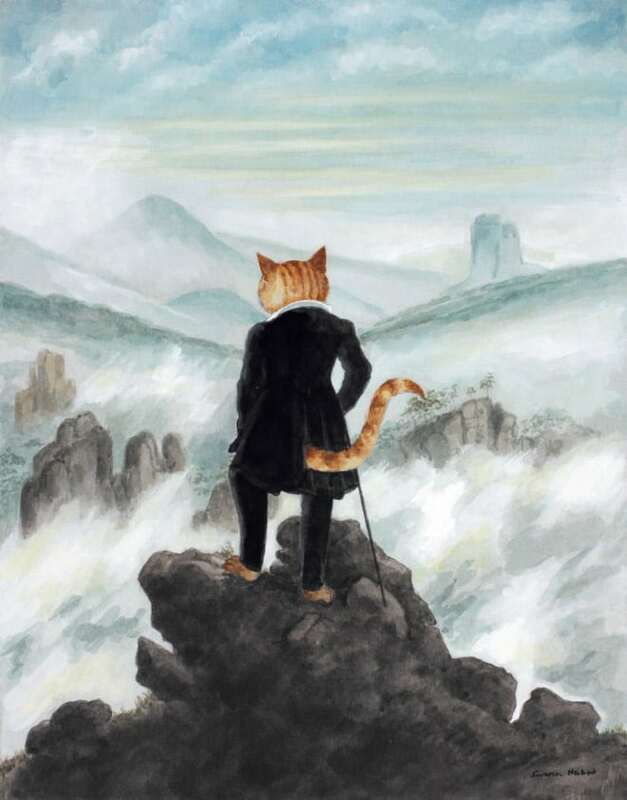 On the cover of her Cats Galore book, you will find a familiar figure serenely looking at you. She’s wearing a blue and gold turban and wearing a big white pearl earring. Ring any bells? However, it’s not the portrait of a young, pale woman you will find, but rather that of a cheeky kitty. Self-described as “a compendium of cultured cats,” Susan Herbert’s hilarious book is spot-on in all its cat-modified paintings. While no one can deny the comedic effect of the art itself, it’s also weirdly accurate. Herbert doesn’t alter any of the original artistic style of the paintings—apart, of course, from switching the human components to their feline versions. 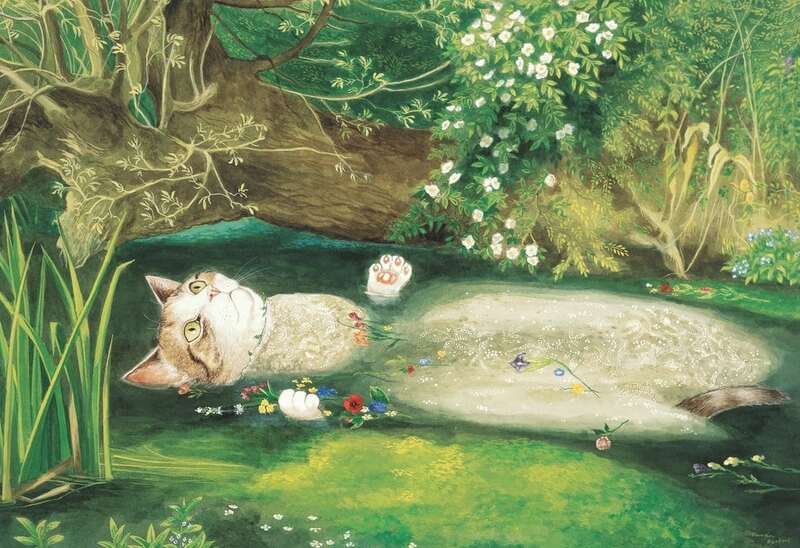 Just look at this revisited painting of Ophelia by John Everett Millais; isn’t the cat’s expression a spitting image of the original Hamlet character? A true artist at work, ladies and gentlemen. 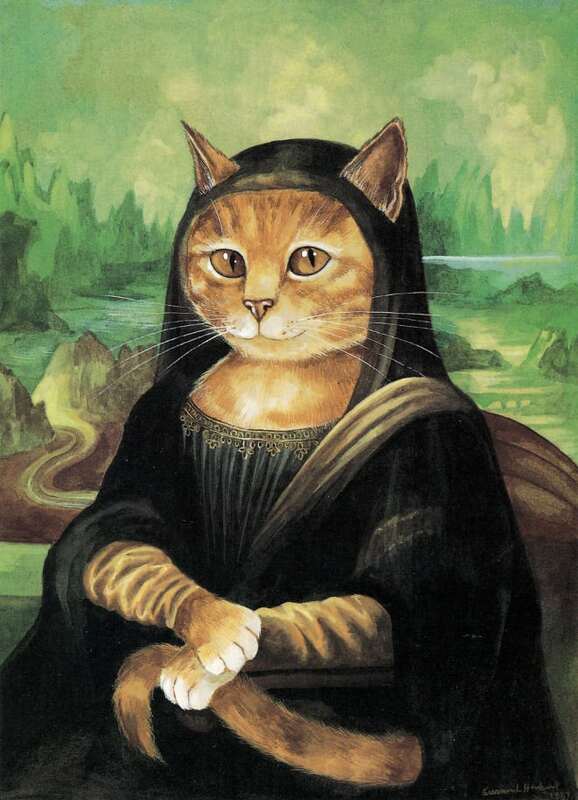 You can’t revisit classics without giving Mona Lisa a feline makeover. You just can’t. Cats Galore is actually split into three sections: Cats in Art, Cats on Stage, and Cats in the Movies. So if you’re a movie fanatic or a theatre lover, you will be served. 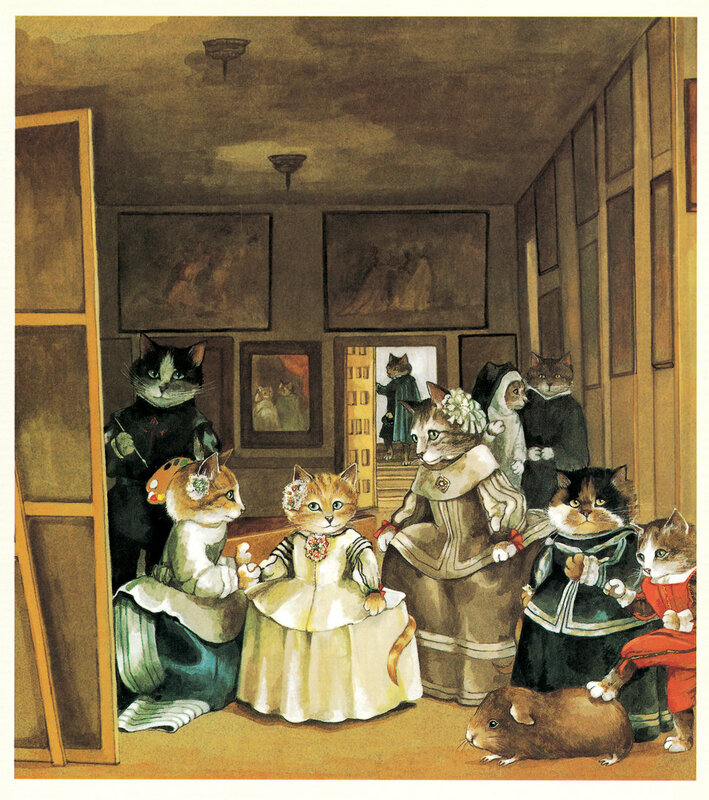 Las Meninas just got a whole lot more interesting with these cute kitties. We feel like we’re stepping into the real world of animal-filled fables. If you’re anything like me, you may have already put Cats Galore in your Amazon cart. As a proud member of the “Crazy Cat Ladies Society,” this is an urgent purchase. FYI, we’re taking in new members. Yes, those sunflowers’ petals had been traded for lush kitties. No, we don’t know why. And yes, we absolutely love it. 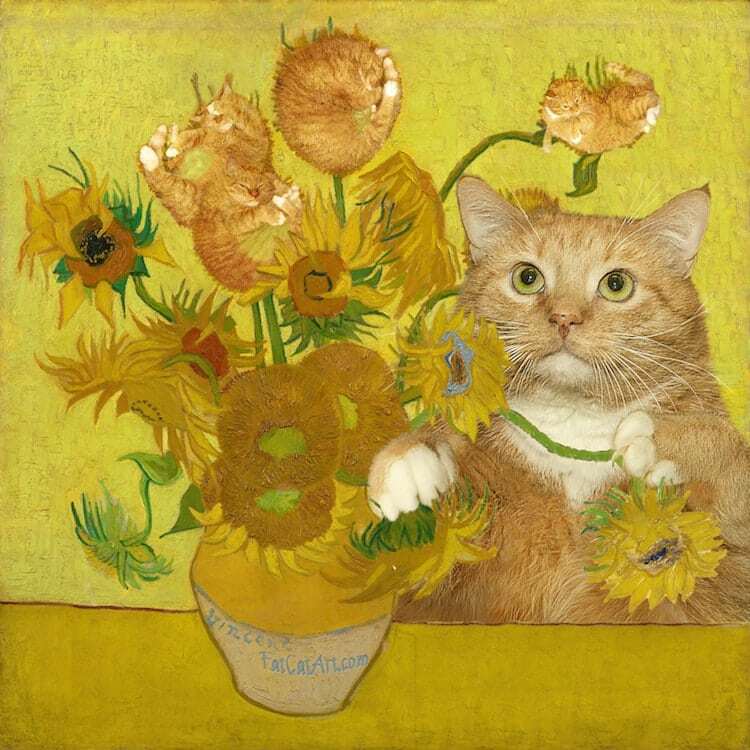 This cat version of Van Gogh’s Sunflowers is the doing of the talented Russian-based artist Svetlana Petrova. And if there is one thing you should know about her, besides her being an out-of-the-box thinker, it’s that she ABSOLUTELY loves Zarathustra, her ginger tabby cat. Petrova explained that Zarathustra saved her from the depression that followed her mother’s death. 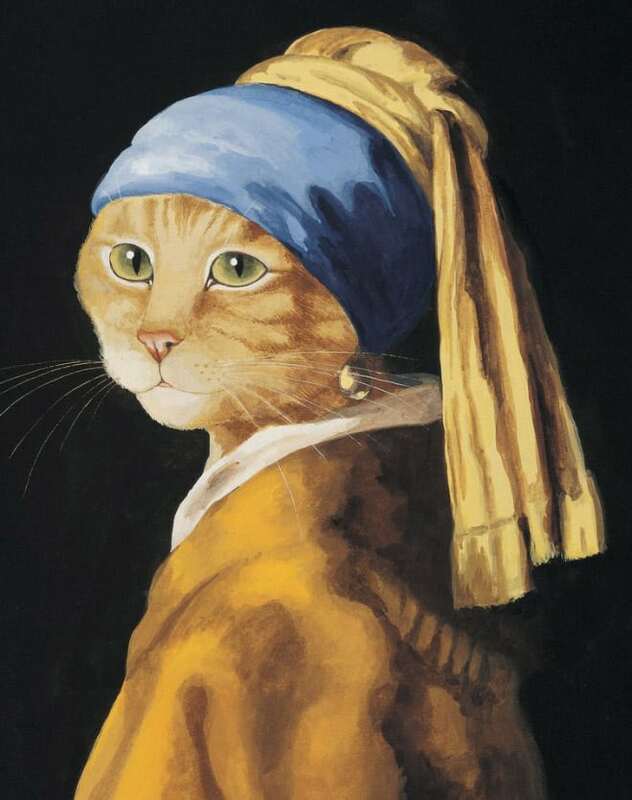 The perfect mix of sensitivity and love for posing that the feline displayed made the artist take on the challenge of fitting him into famous paintings. And to her surprise, the challenge was a total success. The internet went completely bonkers over the ginger cat. 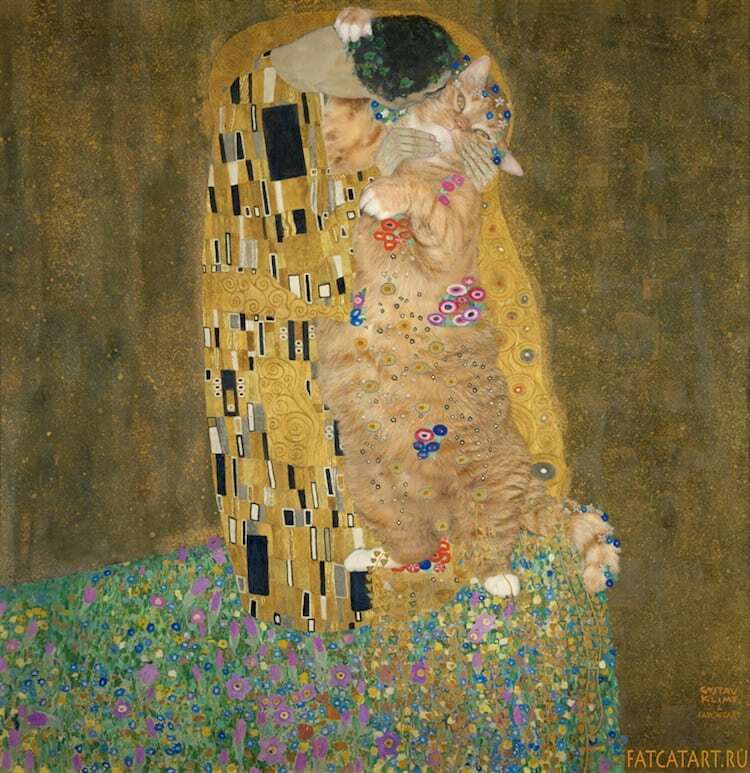 We gotta give it to him: Klimt’s The Kiss has never looked so good! Petrova launched the Fat Cat Art project, where she regularly photoshops and paints her cat into paintings, frescos, ancient murals and even iconic TV scenes (like this hilariously revisited royal wedding video). This lady knows how to have a good time. Meow-chelangelo would have been proud! 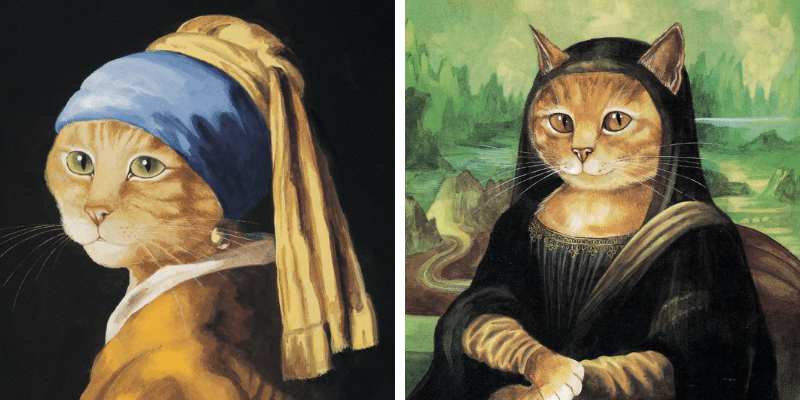 Can cats fit into almost anything, including famous paintings? Yes, they can. And they do it with grace. These feline masterpieces don’t come to life with a snap of a finger. Oh no! Petrova has to photoshop Zarathustra perfectly into a famous painting, print it and then paint the piece again. It can sometimes take months to make it right, as she needs to nail the position and expression. Worth it? Absolutely! 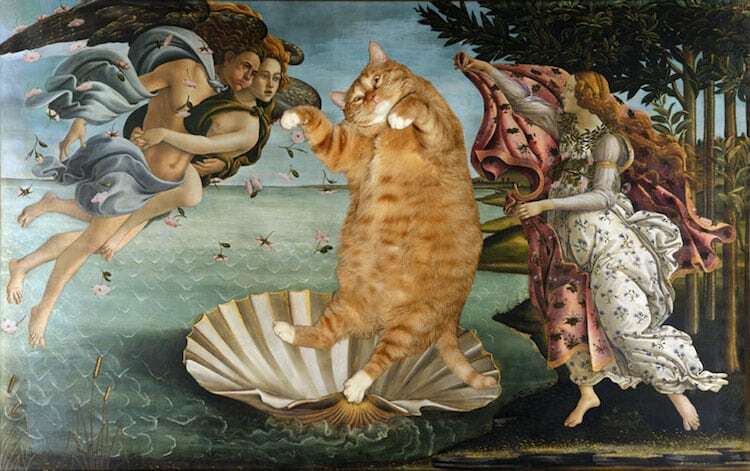 Have you not seen how this feline absolutely overshadows Venus’s original pose? 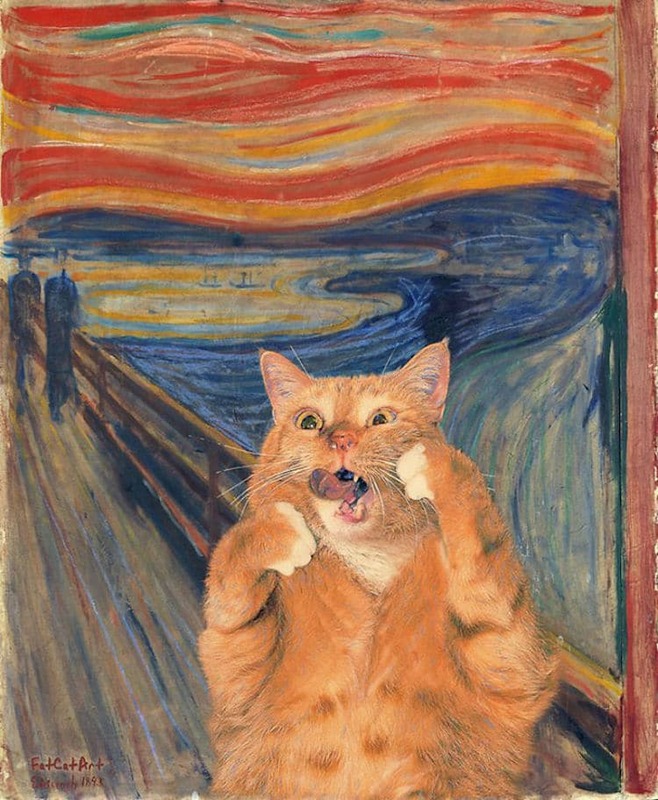 Fat Cat Art is also available as a book: Famous Masterpieces Improved by a Ginger Cat with Attitude. And we can’t wait to get our hands on it. 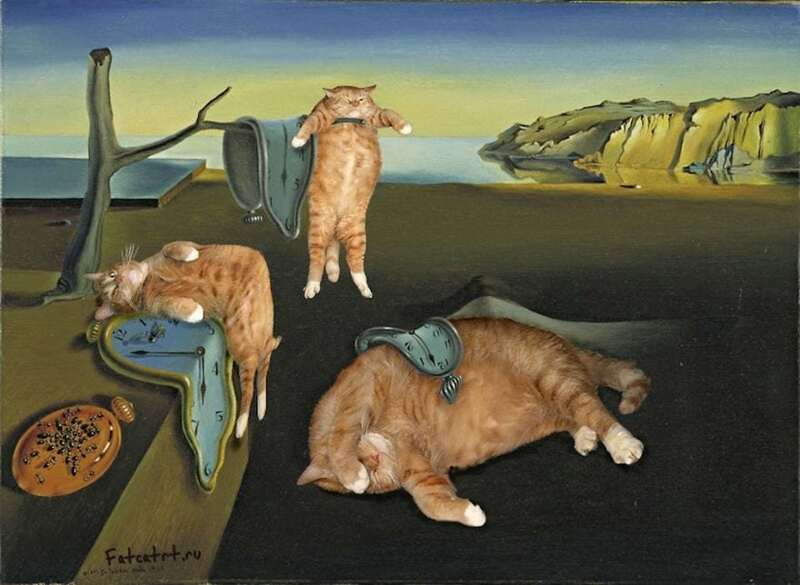 It’s the ultimate full-color collection of her work, like this cat recreation of Dali’s Persistence of Time, in addition to several never-before-seen pieces. We’re smitten! And if you’re still in browsing mode, these must-visit cat websites might interest you. Zarathustra isn’t a simple cat: He’s an internet sensation, a walking meme, a LOLcat. In case you’re wondering where you saw him before, this might be your answer. Even though Zarathustra is impersonating the dance instructor, we can’t help but feel that he might attempt a pas de bourrée at any moment! 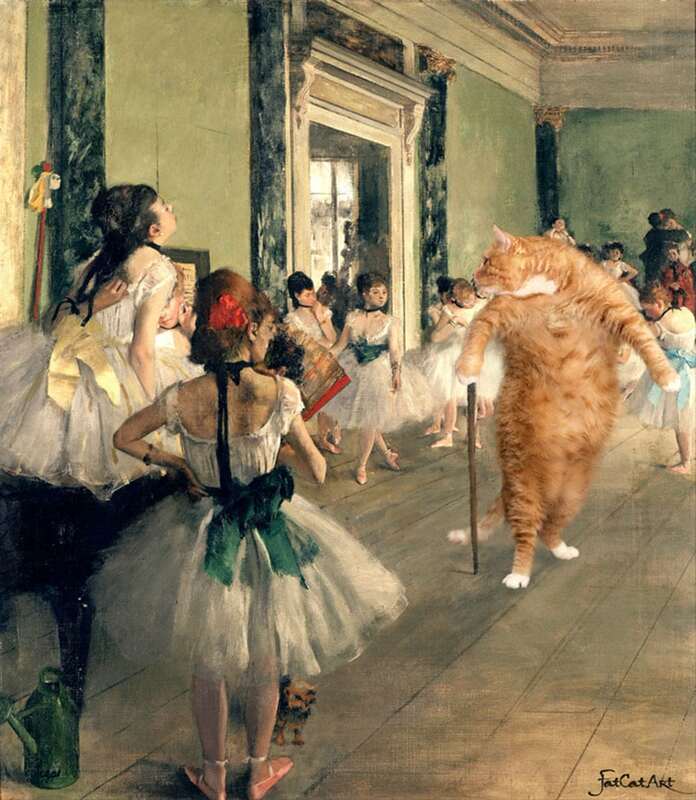 You can see the original The Ballet Class painting in Orsay Museum in France and the cat version in “Meows in Museums” at The Fullerton Hotel in Singapore until October 30, 2018. 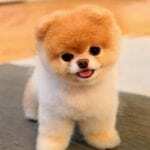 Some pets love food like nothing else, and nothing can distract them from their mission of getting a bite from their human’s plates. This 22-pound cat seems to be one of them. He can’t get his eyes off that tasty sandwich. Well, it’s normal considering he’s in a painting, but you get what I mean. 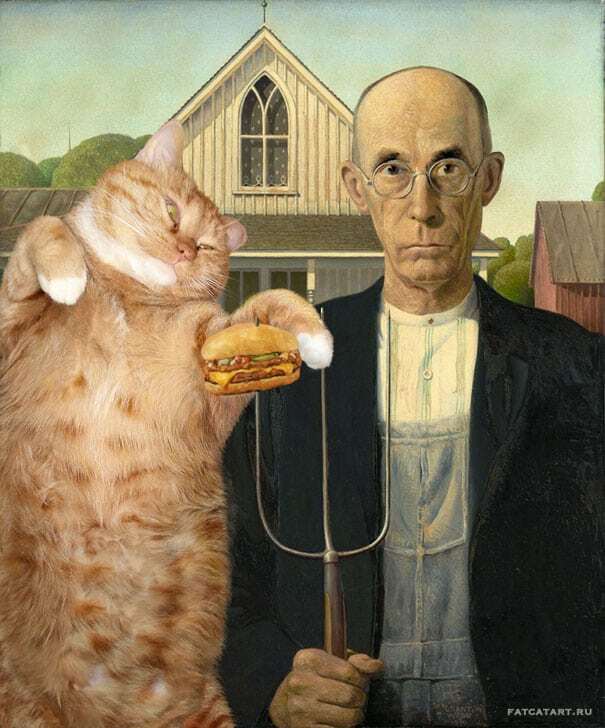 American Gothic is a fabulous and intriguing painting on its own, but with this cat, it takes it to a whole new level. Monet was a passionate horticulturist; this is why many of his paintings are nature-related. I consider myself more of horti-cat-urist. I am obsessed with cats, a lot. And these paintings are like a balm to my soul. Thank you, Svetlana Petrova; thank you, Susan Herpert; you ladies are the real MVPs. What do you think of these cat art paintings? What other animals would you like to see incorporated in classical paintings? Let us know in the comments!